Planktons are a major ecological group of microscopic aquatic organisms that are suspended or floating in that the water column of the ocean, seas, and bodies of freshwater. 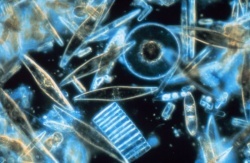 They include plants (phytoplankton), animals (zooplankton), and protists. The animals in this category include protozoans, small crustaceans, and the larval stages of larger organisms, while plant forms are mainly diatoms. Their name comes from the Greek verb planktos, meaning to wander or drift. Planktons drift with currents as they generally having no locomotive organs, or do not have sufficient swimming abilities to avoid transport by major water movements. However, some forms can move several hundreds of meters vertically in a single day (a behavior called vertical migration). Many plankton reproduce daily, some hourly, and some every 10 minutes when the temperature is optimal (often close to 0°C), and when essential nutrients and foods are present. Plankton are usually in largest numbers near the surface. As a result, they can be found in blooms so large they can frequently be seen by satellite imaging. 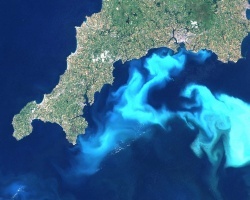 Photo of Coccolithophores bloom taken by landsat (satellite). Many animals feed on plankton, including young fish. This page was last modified on 6 November 2017, at 23:22.